As Bernie Sanders closes the gap to eleven points in the race for democratic nomination, Hillary Clinton should probably heed her own words. They may provide comfort as she tries to wash away the nightmare of the Iowa and New Hampshire primaries, only managing tense victory in Nevada. And yet the quote also reveals the harshest truth behind her troubles. Campaigning in an age where both perception and cynicism are king (or queen), the supposed apathy of the YouTube generation has shifted to anti-corporatism. Establishment 'politics' of all kinds is to be distrusted - Clinton its unwitting political mouthpiece. Don't believe me? Just ask Benny and Rafi Fine, the siblings behind the (once?) hugely popular Fine Bros channel on YouTube. The brothers post reaction videos to content already in the public domain - music, games, viral videos - and have made millions from it. Over the past few years its tentacles have multiplied; there's now Kids React (certain to make you feel old), Teens React and even Elders React. But last month their staple happy-clappy smiles were turned upside down when plans to introduce REACT World, a dedicated avenue for Youtubers to post their own Fine Bros endorsed reactions, backfired spectacularly. The YouTube community quickly saw through shallow claims that it was going to democratise the "react" genre, instead eyeing the move for what it was - an attempt to corner the market and strangle competition. Fine Bros even filed patents to trademark their 'react' concept - essentially basic human behaviour - making it possible to issue large-scale takedown requests of similar videos. The brothers joined a multi-channel network (MCN), a collection of multiple YouTube channels that agree to partner with a company, in this case Fullscreen Inc., to enforce this. In fact, the precedent had already been set months before. 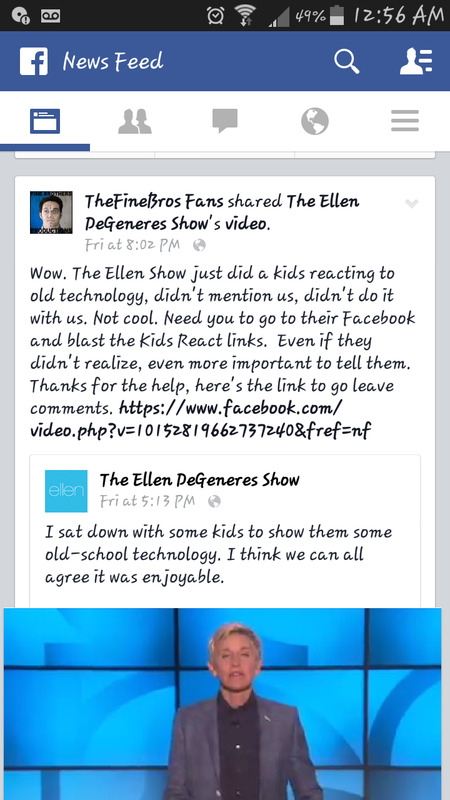 Not only did the pair publicly criticise Ellen DeGeneres for featuring a reaction segment on her show, but also had 8-Bit Eric's reactions to their said videos removed. Watch his vlog below. The negative response spread like wildfire, losing the channel 81,000 subscribers in 24 hours alone. Aside from the hypocrisy of Fine Bros' stance given that they themselves make money reacting to other people's content under fair use, they had breached the founding understanding of the YouTube age. A paradoxical world where freedom to create is seen a right for all, but consumed against the backdrop of a copyright law unfit to keep pace with social media. Users viewed Fine Bros' copyright drive as an attempt to shift the power away from the masses and into the hands of a corporate few. A fight already grossly uneven thanks to MCNs making a mockery of fair use - giving special copyright privileges to 'managed status' Youtubers. In short, the biggest names that make them the most money. And yet, after a week of constant criticism, including a live countdown ticker showing Fine Bros' dwindling subscriber numbers in real time, they caved in. In a post on Medium, the brothers admitted they had been "wrong", immediately withdrawing their copyright initiatives and all current content takedown requests in response to the pressure. A move proving again that there is nothing quite like strength in numbers. Millennials are now transferring this socialist internet ethos into the political spectrum. The rise of Jeremy Corbyn can be explained in part by his marked difference alongside other New Labour – perceived corporatist - leadership hopefuls such as Andy Burnham and Liz Kendall. The same is now true for Bernie Sanders in his battle against Hillary Clinton. To the anti-corporatist youth Clinton is a Super Pac charged, Wall Street tied hoax. Questions certainly need to be answered over her ability to enforce the banking regulations she promises, having received $3 million in paid speeches and $17 million in campaign contributions from them over the years. Sanders, meanwhile, has relied on over a million different contributors, running on a ticket charged with a message of economic equality and redistribution. It is a systematic call for change that resonates with the youth, unconstrained by traditional news sources and using the internet to push their own message of a much more radical paradigm shift.